A replica of the statue in Indiana Jones and the Temple of Doom that turns out to conceal a secret passage when pushed in just the right place. As always when replicating a prop, I started with research. I was unable to find any production shots of the statue and so had to rely on grabbing screenshots from the DVD. Careful examination of statues in the background suggested that there were at least three variations used to dress the set. Unfortunately, the 'hero' design was only clearly visible from a very limited number of angles and the style and detailing of the others was noticeably different. It was clear that I was going to have to make some assumptions about several areas of tha statue. 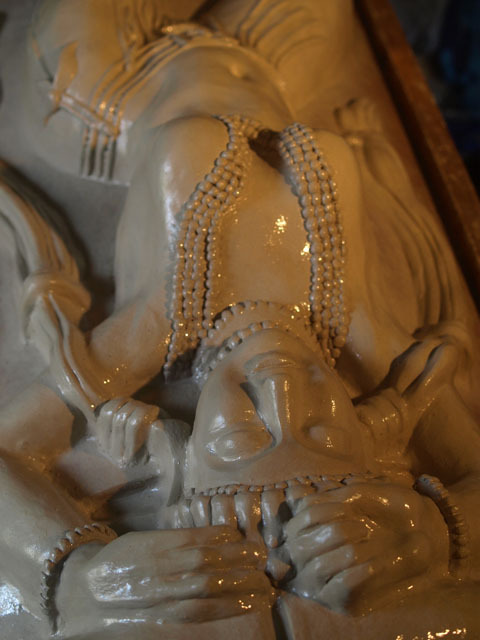 I based some of these on visible elements on the other statues, as well as on pictures of real temple statues that appeared to have been used as reference by the set sculptors. The build started with the construction of a plywood frame curved over rounded formers. I then cut additional formers to define the curved mouldings at the upper part of the pillar. The whole structure was thoroughly sealed with liquid PVA. I drew on the figure's outline, allowing for the distortion caused by the curve of the pillar's surface. Next, I cut pieces of insulation foam to fill in the thicker parts of the figure. This was to reduce both the weight and volume of materials used. 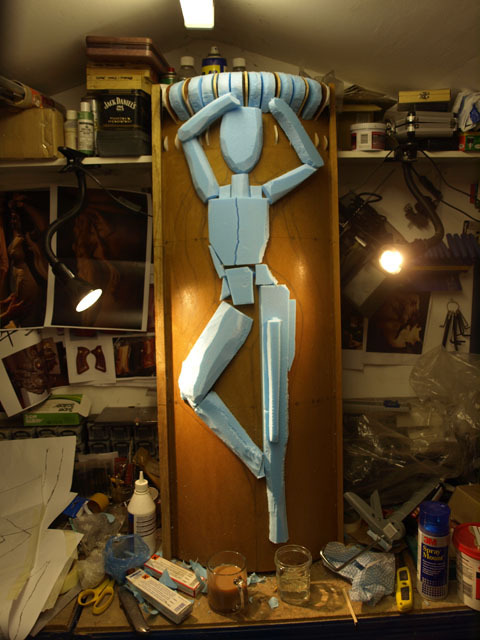 I then started blocking in the main form of the statue using WED clay. Since the sculpt was done over the course of several evenings, it was important to keep it from drying out by spraying it thoroughly, covering it in damp cloths and then wrapping it in bin liners between sessions. I found I needed to mix a little mold and mildew removing liquid with the water to stop mold from growing on the damp surface. Despite my precautions to prevent it from drying out, I still had occasional problems with cracks forming where some parts dried more quickly than others, particularly where they were in contact with the wooden formers. The WED clay was fairly quick and easy to work with, being very soft at first, for building up large areas and firming up after a few hours to hold detail quite well. I had decided to use brush-on silicone to make a one-piece blanket mould. Once the sculpture was finished, I coated it with mould release and then applied two layers of brush-on silicone. I then applied a third coat incorporating sheets of thin cotton fabric for reinforcement. The mould used a total of 3.3kg of silicone but was thinner than I'd have liked. I left the silicone for 24 hours to ensure it had completed curing, in order to avoid alcohol from the silicone from contaminating the resin used for the mother mould. 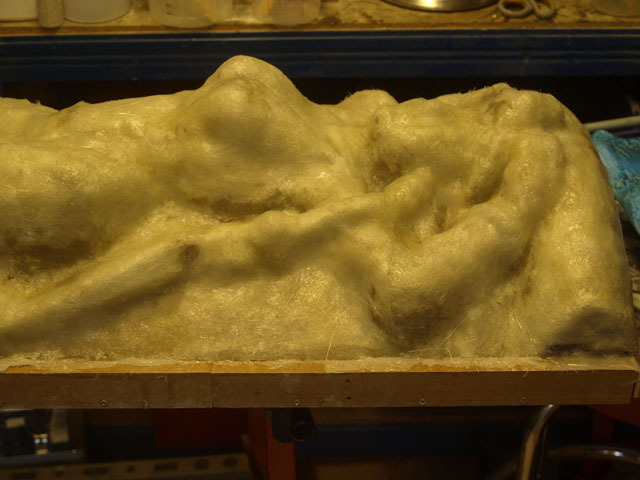 Next I layed up the fibeglass mother mould directly over the silicone. When the fibreglass had cured, I gently eased all of the edges of the mould apart before inserting an air hose from my compressor between the silcone and the sculpture. Forcing air in in this way made it much easier to separate the mould from the model, but it was still not an easy process. In retrospect, although the piece was designed avoiding undercuts, a two-part mother mould would probably have been much easier to work with for a cast of this size. 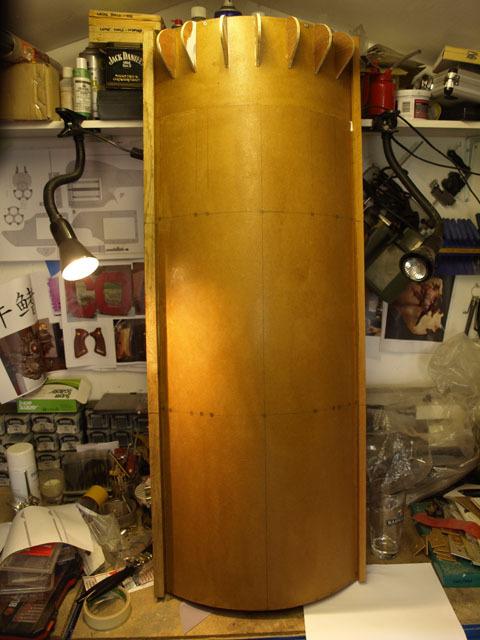 After treating it with plenty of mould release, I applied several coats of Gel-coat to the inside of the mould. It took around 1.5kg of Gel-coat to build up a satisfactory layer in all of the detail. I then applied fibreglass. This was a long process as there were a lot of complex curves and corners. Once the fibreglass had cured, I separated it from the mould, again using the compressed air technique. With the cast safely freed from the mould I worked over the surface removing small blemishes and bubbles. The finish would have probably have been much better had I had the facilities to de-gas large volumes of silicone. Since I was rapidly running out of time, I had to get it ready for display as quickly as possible. Because of this, I was unable to spend the time I'd have liked finishing the surface and working the slight warps out of it. I constructed a display base from timber and plywood and secured the statue to it. The statue was primed and painted before being weathered with acrylic paint using washes and stippling. The piece was displayed at the Memorabilia show at the Birmingham NEC, along with my live display of some of the insect species used in the movie.